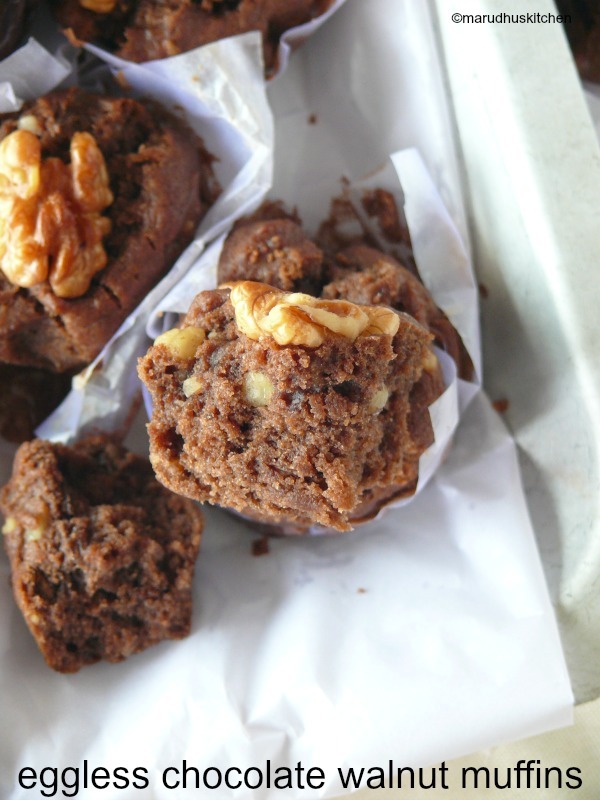 These chocolate walnut muffins will surely be a promising snack with a good dash of cocoa flavour at its best.Muffins are always dense, moist and consistently the way it should be! gives full satisfaction even as a breakfast. Yes! coming to the point of how to make walnut muffins “its very simple and easy dish to make”would be the answer from me.First time I have tried using apple puree instead of yogurt or egg. The result of these muffins totally surprised me with total moist delight.Instead of apple puree you can use even yogurt or even buttermilk and as always the egg replacing options are countless.Instead of using whole of maida alone you can use half and half of whole wheat with it. 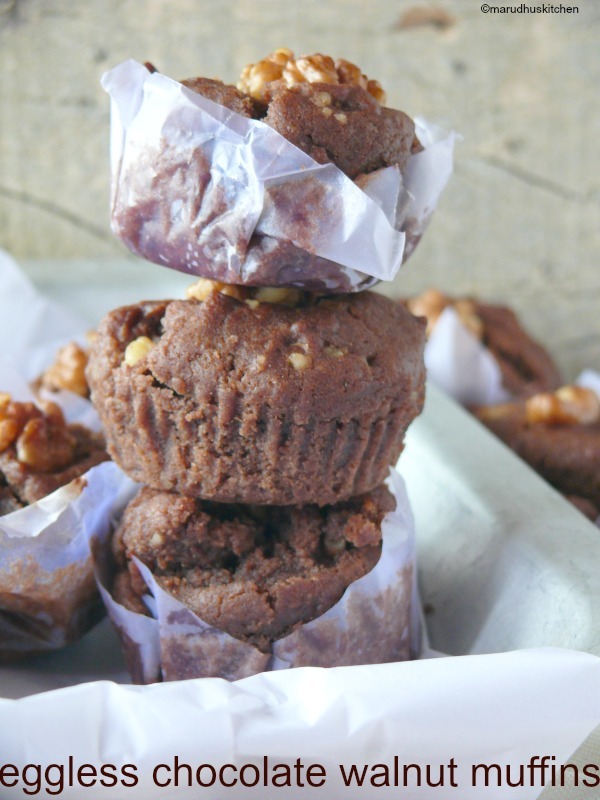 You can use plain sunflower oil for this chocolate walnut muffins. The walnuts and chocolates are deadly combination that you should never miss this time. Now lets see how to make walnut muffins. 2.First sift maida,salt,baking powder,soda and cocoa powder. 3.Add crushed walnuts,mix and keep ready. 4.In another bowl add apple puree,oil,vanilla essence and sugar. 5.Beat till well combined(no need to beat vigorously). 6.Add the flour mix to the wet ingredients and combine light handed. 7.In-between preheat oven at 170 degrees for 10 minutes and line the muffin tins with parchment. 8.Add the mixture to the parchment or muffin cups. 9.Insert whole walnut in the centre of each muffin or else leave it as it is. 10.Bake it in a preheated oven for 20-25 minutes or till done(check for done-ness inserting a skewer). First sift maida,salt,baking powder,soda and cocoa powder. Add crushed walnuts,mix and keep ready. In another bowl add apple puree,oil,vanilla essence and sugar. Beat till well combined(no need to beat vigorously). Add the flour mix to the wet ingredients and combine light handed. In-between preheat oven at 170 degrees for 10 minutes and line the muffin tins with parchment. Add the mixture to the parchment or muffin cups. Insert whole walnut in the centre of each muffin or else leave it as it is. Bake it in a preheated oven for 20-25 minutes or till done. Each oven may vary in baking timing because of the temperature differences. I have cut the parchment into squares and inserted in muffin moulds. You can use muffin moulds instead. I have used organic cane sugar which is brown,you can very well use ordinary sugar too. muffins look super soft & moist! lovely!